Movie Collector’s Loan Manager allows you to track movies that you’ve loaned, who you’ve loaned them to and when they are due to be returned. The Loan Manager can also warn you when a movie on loan is overdue. 1. Via the Loans menu. After selecting one of the methods above, a new screen will appear. Here you can define who you are loaning the movie to as well as specifying the loan and due date. If you accidentally set a return date, click Clear to remove it. 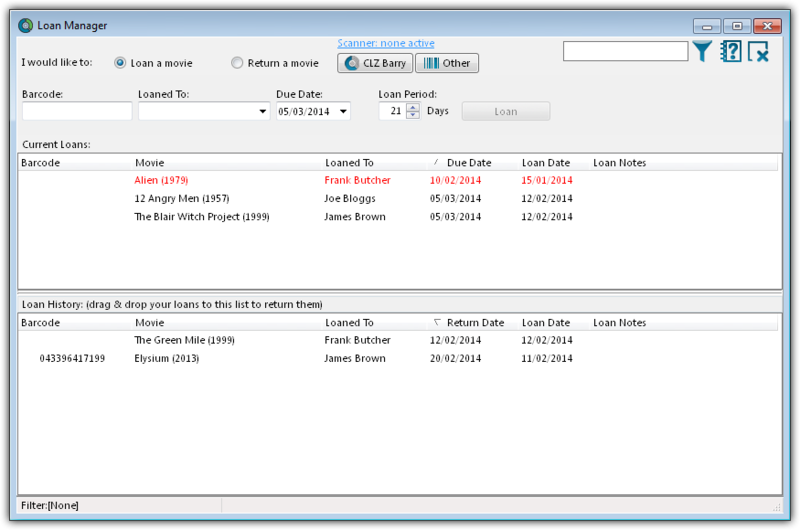 *You can place multiple movies on loan to one person by holding CTRL then clicking on the movies in your Main List. With all the movies selected, use one of the methods above to place all those movies on loan. 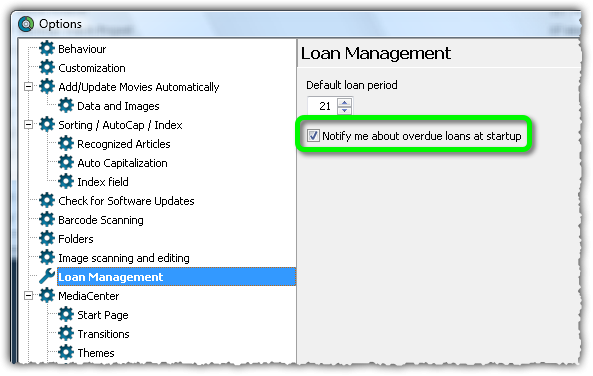 Once you’ve defined the date and the Loanee click OK and the movie will be placed into your Loan Manager. The Loan Manager enables you to quickly see which movies are on loan, who they are on loan to and most importantly, which movies are overdue. You can also loan and return movies directly from here using your barcode scanner. To access the Loan Manager click Loans > Manage Loans. At the top you can see movies which are currently on loan. Entries highlighted in red indicate that the movie is overdue. Below the Current Loans you have your Loan History, this contains the history of all movies you’ve ever loaned, who to, and when they were returned. 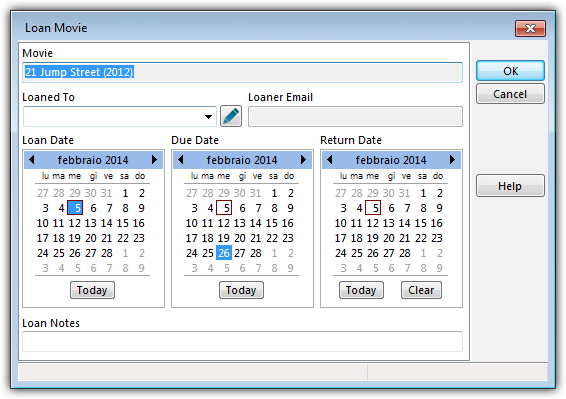 *You can sort or filter your list using the columns and search box. 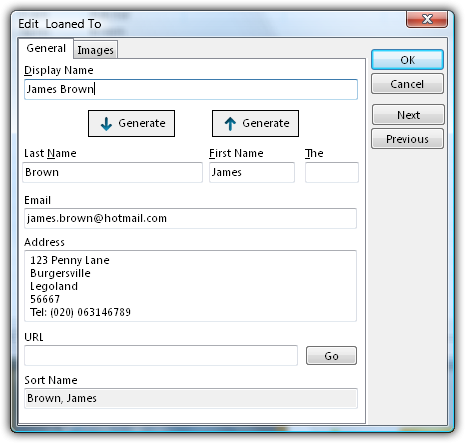 Click a column header to change the sort order, or type something, such as the loanee name into the search box. To activate/deactivate a filter, click the funnel icon next to the search field. Returning movies is just as easy as putting them on loan. You can use the same menu or icons you used when loaning the movie. 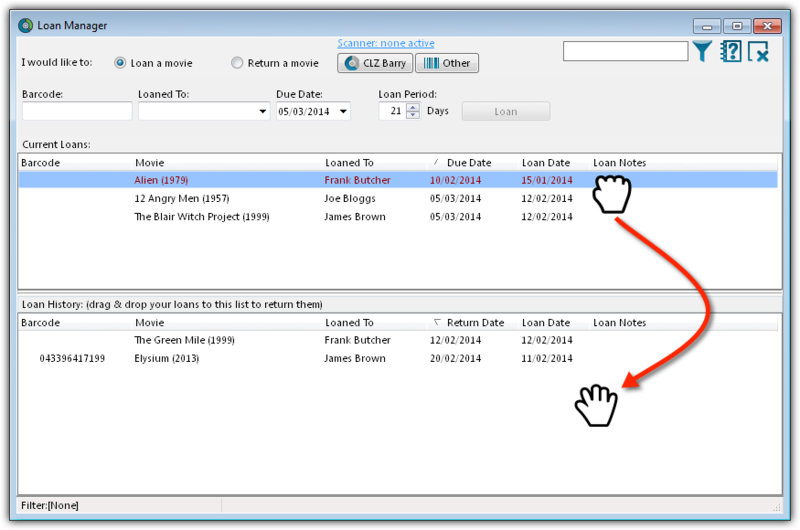 You can also return movies by dragging them from the Current Loans to the Loan History. During the process of loaning amovie you are asked to specify who it will be on loan to. When you do this, the name is automatically added to your ‘Loaned To’ list. 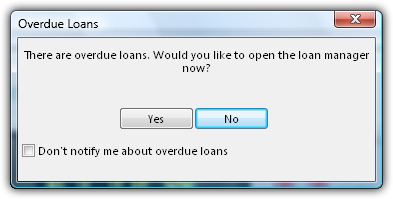 The new Loan Manager now has a built in notification system. If a movie on loan becomes overdue, a pop up appears when you start Movie Collector. This warning will appear each time you start Movie Collector and you have an overdue loan. You can disable the warning by ticking the box ‘Don’t notify me…’. You can also toggle this warning in the Options.